Either ignore my brother, Gilead. Or knock him out of the tree. Then, the limb under my feet tried to buck me off. “Quit it.” I snatched at an iffy branch near my ears while widening my stance. How dumb of me not to have acted quicker. So what if a major reason I was about to risk my life trekking across the enemy’s territory was to save my brother’s? It would be kind of pointless if I killed Gilead now. But at least he wouldn’t be here, twenty feet in the air, annoying me. The shaking lessened some, but I still grappled with the branches next to me. As the shaking eased off, I squinted through the sunlit greenery at my brother. A foot taller than me, he perched on nearby limbs in the shade at the oak’s trunk with one foot still planted on my branch. His arm, one that could haul me over his shoulder without trying, gestured at a limb below us. It was the first step in a climb down into dead bushes and the water I’d soon land in. We both ignored it. Gilead tried to bully me out of the tree with his dagger eyes. And I pretended he’d reharnessed and taken the zip line back home. Another scream. Only blue jays scuffling for territory in the foliage. Birds speckled the forest’s canopy and summer sky. Everywhere except down there. In all the hours I’d watched, nothing feathered had touched that oblong of water. Yeah. That water definitely had something off about it. I sniffed again but still didn’t catch any telltale stink from the giant, freak puddle in the middle of a waist-high bunch of grass. Only the ho-hum smell of baking pine needles and sun-scorched dirt. According to my brother it was a pond—and the best entrance point into our neighbors’ underground home. The leaves next to my shoes quivered again. A threat. I glanced over. His chosen limb seemed sturdy enough for any job. A lot like him. “It’s safe.” He spoke through a jaw that had been clenched for the last six months. His frustration bled through the reassurance of his words. Frustration that I’d been called for this journey. Me. Not him. He was goading me with...what? My supposed fear of those stupid dogs? “If I run, I lead those beasts to the Braes’ door. And every Heathen in Oregon will know where they live. Nice.” My eyes flickered to a shadowed spot between some half-buried boulders at the pond’s farthest edge—the Braes’ hidden entrance—before returning to the too quiet puddle...pond. The hounds hunted far enough away, although they sounded more excited now, which probably meant they’d caught my family’s scent. Maybe they were under our home’s maple trees, balancing on their hind legs. Clawing at the rippled bark and baying up at my grandpa who’d use the buckets of water if he got fed up with it. No. Scratch that. Today he’d keep them from Gilead and me—no doubt baiting them, holding them there. No way would I lead the beasts there. I clenched my fists at the pure evilness of the idea. There was only one way I wouldn’t leave a scent trail for the enemies’ dogs to track. And that was straight down from this providential, jutting branch into the suspicious water below. I’d reach the entrance from there. But he slumped against its bark with crossed arms instead of reaching for the harness. It dangled from the taut wire that stretched to a pine’s trunk, a stone’s toss away. I shrugged off my disappointment. A stupid reaction. I might never see my only brother again because...well...no one promised I’d make it back. But I’d received his half hug and rundown on staying alive back when the sun was high. He was free to fly back home. I wished he would. I thrust my palm outwards. It was the sound I’d waited for—an abnormal hush as the wind died. The whispering leaves became moth wings. The screaming jays muted. Then came the clear directive from Heaven. Rushing air. Painful water. Gasping—lots of gasping. The next terrible minute of my life blurred. But in the end, three things stood out. Question 1: What does Dove Strong believe the symbolic red color to be that will spread across the nation? Do you agree with her? Answer 1: Dove Strong believes the symbolic red spreading across the nation is Christians’ shed blood. She assumes this will be the result of nonbelievers fighting against believers in the Reclaim. Question 2: In your opinion, should Christians, such as Dove’s grandparents, have gone ‘off the grid’ during the persecution of the Purge? Why or why not? Question 3: Does Dove’s attitude towards others change from leaving her Ochoco property in August to returning in September? How and why? Answer 3: Yes, Dove’s attitude towards others does change. In August, she is annoyed to be sidled with traveling partner, Melody Brae. She is obedient but only cares about her own family. She continues to be irritated throughout her journey until near the end, when God softens her heart and opens her eyes. She discovers she cares about Melody Brae. She is touched by Rebecca’s, Hunter’s, and Joshua’s kindnesses. And her heart begins to ache for Wolfe and Jezebel as she broods over their eternities. Question 4: What are the ‘sides’ Dove believes she needs to choose between at the end of her story? List the possible consequences of each choice. Answer 4: Dove believes she must choose between following the Christians into the war the Councils have chosen, or she must defy her people and stand with the nonbelievers who know nothing yet of this war. By choosing to side with the Christians, she risks ending her relationship with Jezebel and Wolfe Pickett as well as possibly disobeying God, who wants peace. In choosing to side with the nonbelievers, she risks estrangement from her family and persecution from other Christians. Question 5: Explain, using examples from the story, whether or not you believe Melody Brae has a strong relationship with God. Answer 5: Melody Brae seems to have a relationship with God since she is aware of her spiritual gift of recognizing danger, something she has received from the Holy Spirit. She also calls out to God for help at least twice when she is afraid. 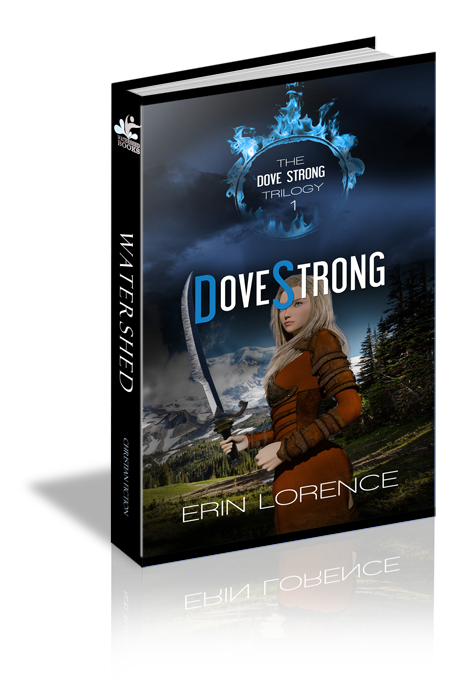 Yet Melody reveals her relationship with God is not strong when she relies so much on Dove to guide them. While Dove turns to God when they face difficulties in their journey, Melody turns to Dove. Question 6: Dove Strong lives in the future. Do you believe that in this future where she lives, God is gifting more Christians than He does now, or do you think that the future Christians are better at recognizing their gifts? Why? What talents or attributes has God gifted you, and how are you using them? Question 7: Why do you think God guides Dove’s path to coincide with Wolfe and Jezebel, nonbelievers with worldly morals? Answer 7: In Dove Strong, God guides Dove to meet these two nonbelievers because He plans to soften Dove’s heart toward people who don’t know Him. This first contact causes Dove to question her people’s abandonment of the Great Commission. Question 8: Reed Bender uses scripture from the Old Testament to support his argument for proviolence. Explain why the Reclaim is not Biblical. Answer 8: Jesus’ life on earth is the perfect example of why the Reclaim is not Biblical. Jesus did not use his time on earth to overthrow the ruling government and become a ruler or King of this world. He lived His perfect life teaching about God as well as teaching us to love God and each other. Question 9: If you were forced into temporary hiding to save your life, choose whether you’d conceal yourself underground (like Micah) or in a forest canopy (like Gilead). Explain the pros and cons of your decision. How would you protect yourself? Bonus: What would your residence look like? Answer 9 The pros of living underground would be the following: A greater sense of security since the likelihood of being discovered underground is less, the entrance tunnels that are easier to defend against an attack, a fresh supply of grubs and moles to eat daily, and as big of a shelter as you desire as long as you can dig it and prevent it from caving in. Cons would be: The darkness, cave ins, no fresh air, and limited provisions. The pros of living in the forest canopy would be the following: Fresh air and sunshine, birds—a food source as well as their songs, and the ability to see an attack coming. The cons would be: Less security since the likelihood of being discovered is greater, the threat of fire, the risk of falling, and home construction is dependent on the availability and condition of nearby trees. Question 10: In Dove Strong, God calls messengers every seven years to make a dangerous journey. What has God called you to do this year? Are you obeying Him, and how could you do your calling better? Answer 10: The answers will vary. God often does not send us on a journey to do His will, but He will use us where we are. No matter what, He calls every follower to be brave and speak truth in love for Him.